Stage One: Introduction to Custom Picture Framing. I have been custom framing since 1983. The first shop I worked in was Western Picture Frame, owned by the Luckey family. 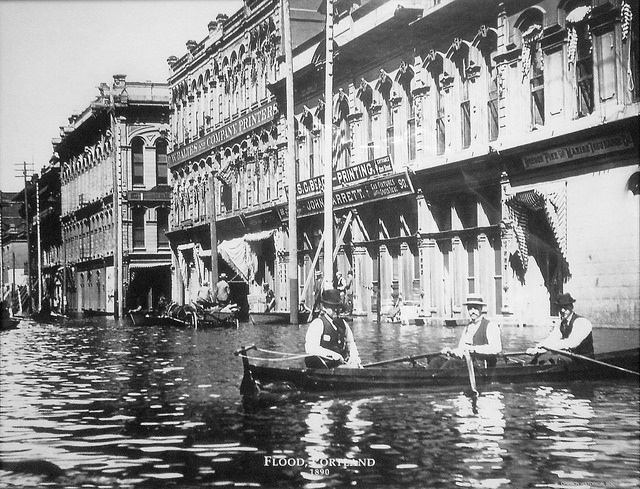 This shop had been in the same family and location on NW 1st in downtown Portland since before the 1890 flood. This was a cast iron front building similar to those at the right. They had a photo on the design table that picture the shop with a boat tied in front and a window sign "We deliver by boat". I was immersed in the history of framing, molding and techniques. On the third floor were moldings dating back up to a hundred years on a mezzanine around the main floor. I also saw and worked with the damage caused by early paper mats; burns, weakness in the paper of the art, and discoloration caused by the lignin and acids in paper mat (see conservation/preservation). I saw the damage done long before it became most framers and consumers started learning about conservation or preservation framing. Frame It Yourself in Ramsey, NJ. My cousin Paula recruited me to move to Ramsey NJ and run her Ramsey, NJ "Frame It Yourself" business. I worked as a manager and expanded the design and technique capabilities of the shop. I brought skills from my Western Picture Frame experience to the NJ shop. Framing techniques such as french lines, painted bevels, fabric mats, closed corner frames and a more sophisticated style than the previous manager. Paula and I had similar design aesthetics so it worked well. I enjoyed the time and the learning. In our shop customers had the option to save money by building the frame and fitting their project, The shop cut the mats, frame, did the mounts and other technical work. Many times a customer would do it themselves and then in the future opt to have us do the work. They understood and appreciated the value of the work we did after trying it themselves. We had a die-hard DIY following that came on Thursday nights to frame and chat. I lived in Southern New York state (the town of Warwick) and got to experience true seasons, snow, rain, heat (humidity-ugh!) and the much slower spring of the east. I, of course, did Leaf Peak tours with various family members. After 5 years I decided to move back to Oregon. Stage 3, Working in a variety of custom frame shops and gallery spaces.